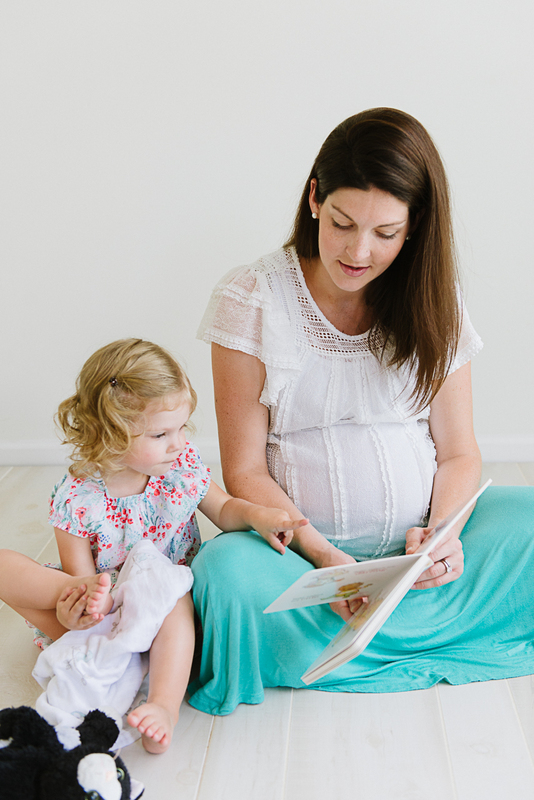 I had an uneventful pregnancy, despite 16+ weeks of violent morning sickness. I tried all the tricks you can find on Pinterest for morning sickness, and ended up with a prescription for the vomiting. I had an 18 month old to care for, so despite my pride at trying to tough it out, I needed the assistance. Thankfully, Diclegis is a Godsend — I was a tad groggy, but I could usually make it through the day. I started out about ten pounds less than when I got pregnant with our first, but ultimately delivered at the same final weight. I gained 50 lbs total, but I didn’t gain any weight until after the morning sickness ended around 18 weeks. We declined genetic testing and the first and second trimester screens, and opted only for the ultrasounds. At 18 weeks during our anatomy scan, we learned she was a girl! I had been seen by an OB throughout this pregnancy. I got more unhappy with their care after 20 weeks. I began feeling like I didn’t matter as a patient: the nurses didn’t listen, the schedulers were rude, and the doctors were always rushing me out. Since our first was a hospital delivery under the care of this practice, I thought I would like to deliver with a midwife at a birthing center next. I was under the assumption I would be unable to switch practices after 20 weeks pregnancy for insurance reasons. Rather unexpectedly, at 35 weeks pregnant my husband told me he wasn’t sure we would be having more kids after this. 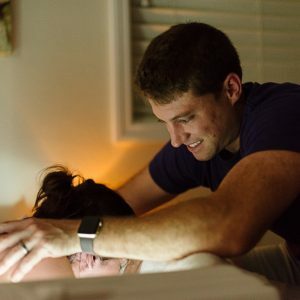 That motivated me to see if I could switch to Baby+Co, a birth center in Cary, NC. I had heard good things about their midwives from friends and acquaintances who delivered there. I did my research and knew this was where I wanted to deliver, too, if possible. At my 36 week check-up, the doctor did a cervical check and we learned I was 75% effaced and 0 cm dilated. I was going to PT then for some sciatica and tailbone discomfort, and we learned she was head down at 0 station early on. By 37 weeks I was having irregular non-painful Braxton-Hicks contractions. I felt very big and was getting more and more uncomfortable. At 37 weeks I was still at the OB office, so we got another cervical check: 80% effaced, 2cm dilated. The day before my 37-week checkup I was stung by a bee and had a mild reaction. As a result I had to have some blood tests to make sure the itching was just an allergic reaction instead of cholestasis of pregnancy. Thankfully, it was just hives from the bee sting, but the good news was I got a non-stress test to listen to her heart beat a little more (after all this time, it’s still such a sweet sound that brings tears to my eyes)! I began using Evening Primrose Oil: 1 capsule vaginally at night, 1 capsule orally in the mornings. This is supposed to help ripen (thin or soften) the cervix (not jump start labor) so that when the cervix reaches full dilation, labor can be quicker and faster. I hadn’t tried this with my first, so I was curious to try this time! At 38 weeks I was accepted as a patient at Baby+Co, so I did not receive any more cervical checks (the midwife model of care believes that unnecessary disruptions and interventions in a physiologically normal pregnancy can introduce infection or cause undue stress to the mother), so even though I agreed, I was a bit glad I’d gotten to switch practices so late in the game because I went into it knowing I was already 2cm! (Why does it matter how many centimeters I’m dilated, if I’m not in labor? When it’s time, we’ll know!) They did use a doppler to measure the fetal heart rate in the 140-150 range, and my blood pressure was good. I loved the midwives I met instantly, and I was ecstatic to be a patient there. At 39 weeks I was having more “regular” Braxton-Hicks contractions (sometimes about every 8-10-12 mins) for 1-2 hours at a time for a few nights. I had no pain (except gas and SI joint/sciatic nerve — let’s be honest, at 39 weeks pregnant you’re just glad you can get yourself out of bed and dressed). In addition to the Evening Primrose Oil, the midwife recommended Red Raspberry Leaf Tea up to 3c/day. Fetal heart rate was 150, and baby was engaged (midwife couldn’t feel her head; she was so low down she could only feel the pubic bone!). At 40 weeks I was feeling more exhausted, more uncomfortable bending/squatting. My mom had come into town on my due date. The birth center can deliver between 37-42 weeks, and they only do non-medical inductions (they also have no medical pain management for labor). At 40 weeks +1 we had a quick ultrasound to confirm her head was in fact so low it was IN my pelvis. Her fetal heart rate and my blood pressure were both good. At that point, it was just a waiting game. The next day I got super uncomfortable: I was all kinds of gassy, hungry, feeling pelvic pressure, feeling the baby move but it sometimes hurt. I tried to track her movements and not freak out. God’s timing is perfect; I knew He knew her birthday. 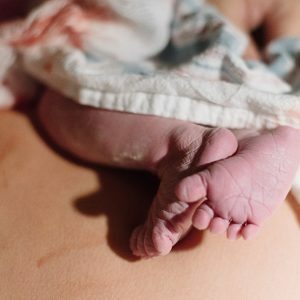 At 40+3 I began to feel anxious that I wasn’t going to have her by 42 weeks, and after all my work trying to switch to the birth center, I was worried I was going to end up with a hospital induction after all. On the way home from dinner, I began to feel more intense contractions (not just Braxton-Hicks) that began at 7:05pm. They were roughly at 5-8-10 intermittent intervals, some longer. I started to get excited, and they noticeably slowed down/spaced out by around 10pm. I started dusting the A/C vents! That’s when I realized I had too much energy for it to be the real thing, and I needed to rest instead. That night I slept from 11pm-8am, and only had 3 contractions the whole night. At 40+4, I had a few random non-painful contractions. I went to the pool with my mom and my toddler. I was grouchy from the false start the night before, and too uncomfortable to wear pants so I only had on a cotton maternity dress. I brought my bathing suit to the pool but I was too uncomfortable to bend down for long enough to put it on, so I sat in the shade with my feet in the water instead. I passed the mucous plug, or part of it, around 12:30/1pm, but no change in the frequency/intensity of any contractions. Contractions were still uncomfortable, but not exactly painful, and kind of all over the place: no consistent intervals. The contractions did seem to get more regular when I moved around so I’d been resting! We came home from the pool and put Claire, our 27-month old, down for a nap. I laid down for a nap at 2:35, and fell asleep. I felt my first “ouchie” contraction (that’s how I described it to Jason) around 3:55pm, but was able to fall back asleep for another 30-40 mins. The contractions were at inconsistent 5-8-10 minute intervals at low intensity (for example might wake me up from napping but I could still talk through them and relax completely between them) til about 5:30-6pm, and picked up what felt like slowly in intensity from there. In the middle of cooking dinner ~7pm, I had to stop talking and moan or sing through the contractions. I tried to sit on the stability ball while I ate dinner, but she was so low I was too uncomfortable. I stood instead, or squatted. The contractions picked up intensity again right after dinner (a burger from Whole Foods, ironically the same dinner we had the night I went into labor with Claire) and by the time bathtime was finished and I laid Claire down at 9pm in the midst of a contraction, they were consistently 3 minutes apart, each one lasting about 45-60 seconds. Jason suggested we call the midwife since we knew there was no one there and they’d have to come from their house. A half hour later we were on the way to Baby+Co. Thus far, the worst thing about the whole process was laboring in the car. There’s something about a screaming wife in the passenger seat that just makes a husband want to drive as fast as possible, which in our case is NOT the most comfortable. Part of me was a little anxious we would be TOO early because I was able to call our photographer in between contractions and make jokes with my family (they weren’t funny jokes, but my jokes are rarely funny even NOT in labor, so that was nothing new). We arrived at Baby+Co at 10:15pm. There were two midwives (a supervisor and a new transfer) and two nurses waiting for us, and our photographer met us shortly after. We were the only patients. They only checked me once: I was 6-7cm dilated, 90% effaced, and the baby was at 0-station. As I breathed through contractions and wrinkled my face, Mandesa showed Jason how to put his hand on my forehead to help relax my face. (There’s a known connection among midwives between the tightness of your lips and face and how relaxed/open your cervix is. I’ve been through labor and delivery twice, and I can tell you this is absolutely true.) She asked me what my birth plan was, and I told her I had two main objectives. 1) I wanted to labor in the tub: I was open to a water birth, but it wasn’t in my plan so that if it didn’t happen, I wouldn’t be upset about it. 2) I wanted to feel the primal urge to push: with my first, I was told when to push and for how long, and this time I wanted to feel that power from within. Minutes later, I stripped my dress off and got in a nice large tub. The lights were off, and I had my husband play my church’s Easter playlist on Spotify, which contained some of my favorite worship songs. The midwives put a mirror and a flashlight in the tub, and were monitoring the temperature of the water to stay between 97-100 degrees. The catching midwife, Stacie, wanted to check me again in the tub and Mandesa (the supervising midwife) reminded her we were at a birth center. I heard her tell her there was no need because my body was going to do what it needed and we didn’t need to meddle in things. This was so encouraging for me to overhear. They had confidence in my body, and so could I! I was in transition by the time we got to the birth center, so the tub was extremely helpful. It was deep enough that I could “float,” but shallow enough to brace myself on the bottom and edges if I needed to. I labored on my back in the tub for a little while, but kept feeling the urge to turn over on my hands and knees with each contraction. I finally did get into this position, and my contractions instantly intensified. The urge to push came quickly, but wasn’t as intense as I expected. It wasn’t a primal “GET OUT OF MY WAY IM PUSHING” urge like I imagined it would be. It was gentle at first, almost as if my body sent a message to my brain to say “we’re ready when you are.” My water broke in the tub. Right before my first push, I heard the midwife comment on seeing bloody show: a good sign that my water was breaking and that she was ready to come out! I pushed less than ten times, I think. And I had no idea it hadn’t been very long. I was still afraid during my first push because I was scared I was going to experience 3+ hrs of it like I did with Claire. Stacie held her hand on my bottom for counterpressure and talked me gently through crowning so I didn’t tear! She told me when to push gently, when to pant, just like she said she would. I felt Nora crowning, and she came swiftly. She was born in the water while I was still on my hands and knees. Stacie passed her between my legs up to me and I grabbed her from underneath my belly as I rolled onto my back to sit up. It was love at first sight. Nora was born at 11:41pm, less than 1 1/2 hours after arriving at the birth center. She weighed 8lb 9oz, was 20.5″ long, with a 14″ head circumference: truly perfect in every way. After she came out, the midwives drained the tub and helped me to a nice, comfy queen size bed in the room for skin to skin. Nora latched almost immediately and began nursing while the midwives helped deliver the placenta. It took midwives a while to stitch me up, I guess taking great care or just learning from one another. I ended up with one superficial tear thanks to the midwives’ coaching and lack of meddling in what they described as “a perfectly wonderful and normal physiological birth.” The body does what it needs to! One thing we didn’t realize was that when they told us at the class to “bring food” they meant a legitimate meal. I couldn’t have any ibuprofen for the afterbirth pains until I had a full meal, and a cooler full of Kind bars and Gatorade didn’t count! So Jason actually had to leave to get some lunchmeat and cheese from the nearby grocery store since it had been more than 4 hours after my dinner. They discharged us at 4:30am (she was just 5 hours old), and we arrived home a little after 5am. That was a SCARY drive: we were exhausted by that point, as much of the adrenaline had worn off, and there was no one else on the road! Claire wasn’t even awake yet to realize we’d left at all. (My mom was still in town for another 2 days, and got up with her in the morning). We recorded Claire meeting Nora around 10:30am when we brought her downstairs. It was adorable! One of the best things about this entire experience, in addition to the amazing amenities and swift natural delivery, was the fact that I was able to labor at home AND recover at home. Being home with my new baby made the recovery process so much easier. With my first, those 2 days in the hospital were exhausting after 36 hours of labor: doctors and nurses coming in every 30 minutes, and us not getting any sleep. This time I was able to sleep and rest at home, on my own couch, or in my own bed. Jason was off work for a month to take care of Claire, leaving me free to rest with Nora when I needed to. The birth center called us at 24 hours to check up on recovery and the baby’s progress (nursing, diapers, etc), and then a midwife actually came to my house for the 2-day checkup (baby’s weight, our heart rate and blood pressures, a vaginal exam, the infant blood tests required by the state, and a hearing check). It was such a relief to be able to get a jump start on adjusting to a family of 4 as soon as possible. There is just something so comforting about being in the safety and security of my own house. I don’t know how many, if any, more kids are in our future. But I do know my experience with the midwife model of care, particularly the midwives at Baby+Co, was so enjoyable that I’ll be going there for all my well woman and postpartum checkups, as well as recommending them without hesitation to all my expectant friends. 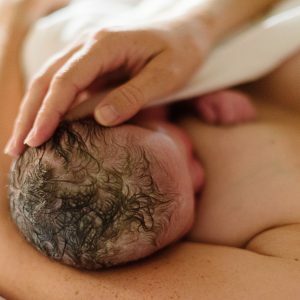 All birth stories are beautiful, and they’re all uniquely different in their own special way. What about you? What’s your birth story like? Did it follow a plan?